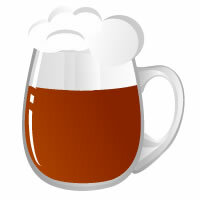 All Grain American Brown Ale homebrew recipe. This homebrew recipe uses the following ingredients: Great Western 2-Row, Carapils - Dextrine Malt - US, Caramel/Crystal 20 - US, Caramel/Crystal 40 - US, Caramel/Crystal 80 - US, Roasted Barley - US, Flaked Oats - US, Amarillo Hops, Cascade Hops, White Labs California Ale V WLP051 Homebrew Yeast, White Labs California Ale WLP001 Homebrew Yeast, Irish Moss, Yeast Nutrient. This recipe was cloned from The Brown Tammy. Tested when kegging. It tastes great, roasty and clean, very good. The roasty flavor is very well rounded, can't wait for carbonation. Will do, thanks for the tips!